SpaceX on Friday said a partially-reused rocket successfully launched and deployed the latest group of satellites to upgrade communication networks for Virginia-based company Iridium. "We have successful liftoff of the Falcon 9," a SpaceX commentator said after the rocket roared off with a tail of fiery exhaust from Vandenberg US Air Force base in California. 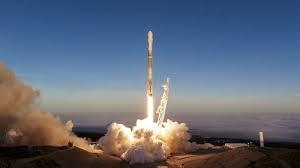 SpaceX confirmed in a tweet the "successful deployment of all 10 @IridiumComm NEXT satellites to low-Earth orbit." It was the fifth set of 10 satellites that SpaceX has launched for Iridium, whose $3 billion project is expected to include a total of 81 satellites -- with 75 launched by SpaceX. The first stage of the rocket sent aloft on Friday had been used in October for a previous launch as part of the project, known as Iridium NEXT. SpaceX did not attempt to make another recovery of the rocket's first stage after Friday's launch. However, it did try to land the fairing -- the rocket's nose cone -- on a SpaceX-owned boat named "Mr Steven," which is equipped with a huge net. CEO Elon Musk said on Twitter the fairing "impacted water at high speed," without confirming explicitly if the landing was successful or not. Musk aims to make rockets as reusable as commercial airplanes, bringing down the cost of spaceflight and boosting efficiency. In February the company's Falcon Heavy, the world's most powerful rocket, blasted off on its maiden test flight carrying Musk's cherry red Tesla roadster car. The Iridium project, though less flamboyant, will replace the world's largest commercial satellite network of low-Earth orbit satellites in one of the largest "tech upgrades" in history, improving mobile, voice and data networks, Iridium has said. Some of the satellites are designed to help track ships and aircraft in real time.